Blooming dandelions are a sure sign of spring. 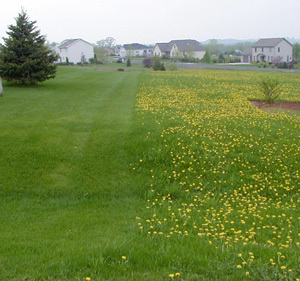 Many people do not like dandelions when they threaten to take over a lawn. Taxaracum officinale, a common plant of grassland and cultivated ground is native to Eurasia, but has naturalized in all parts of the Northern Hemisphere thru USDA Zone 3. Most people are less than enchanted with dandelions – particularly when they’re more numerous than the grass in a home lawn. But this plant is actually cultivated in some places, and used for both food and herbal remedies. Dandelion is a good colonizer that is excellent at dispersing its prolific seeds. The leaves are shallowly to deeply lobed. Dandelion is a short-lived perennial that will grow just about anywhere, regardless of soil conditions, but rich soil will improve its growth. They withstand frost and freezes and tolerate crowding. Heat and insufficient moisture will cause the leaves to get bitter, but it won’t kill the plant. The lance shaped leaves grow in a rosette, emerging early in the spring from the crown. Individual leaves may be entire or lobed, with the toothed lobes anywhere from shallowly to deeply incised. Different lobe patterns may occur on the same plant. The rosette of leaves can be a food plant for the caterpillars of some butterfly and moth species. Dandelion grows in a rosette. A flush of bright yellow flowers are produced very early in the spring. Even though its flowers are more conspicuous early in the season, it will bloom almost throughout the year. Each solitary inflorescence consists of numerous ray and disc flowers borne together in a daisy-like flower on the end of a smooth, hollow stalk. The stem contains milky latex sap. The length of the flower stalk varies considerably depending on the conditions. The fat green buds (L) open (C) to expose all the numerous ray and disc flowers (R). The flowers are utilized by bees and other pollinators and can be an important nectar source early in the season when few other flowers are blooming. The flowers are used by bees and other pollinators, and can be an early source of nectar. The flowers are followed by the distinctive globe-shaped seed heads. Each seed has a pappus, a feathery parachute of soft, white hairs that makes it easily carried by the wind. Each plant can produce up to 20,000 viable seeds. The flowers are followed by the distinctive globe-shaped seed heads. The fleshy tap root allows the plant to survive drought and regrow readily. Dandelion can also reproduce vegetatively from pieces of tap-root, with the upper sections of the root having greater viability. 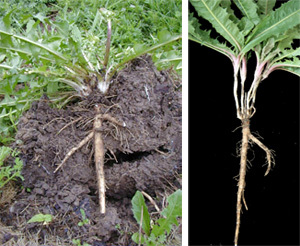 The deep tap-root, up to 3 feet long (but usually 6-12”), allows it to survive drought and competition with other weeds. Depending on your perspective, dandelion is either a weed or wild vegetable that is more nutritious than broccoli and spinach. 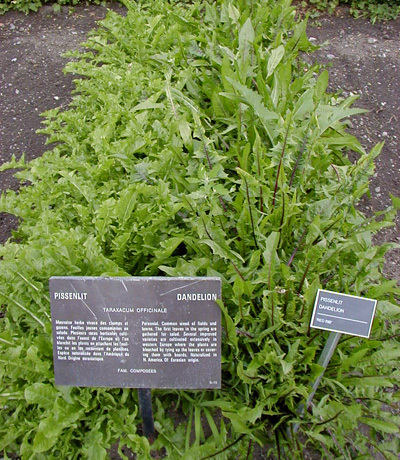 Though never cultivated as a vegetable in Europe, plants were brought to market in England in the 19th century when lettuce and endive were scarce. And dandelions appear on the menu in some locations. In Catalonia pheasant or duck is often prepared with dandelions in the fall (el faisà o l’ànec amb queixals de vella) and in Macedonia Radíkia Me Rízi Tis Kyrías Agápis is a dish of dandelion and chicory cooked with rice and pine nuts. 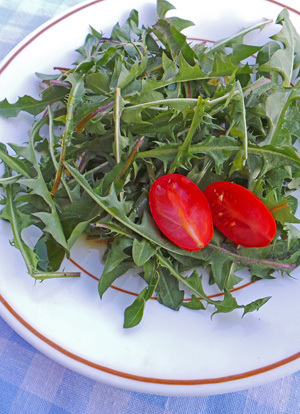 The tender young leaves make a good subsitute for other greens in salads. Nearly all parts of this plant can be eaten. Regardless of which part you intend to eat, make sure the dandelions have not been treated with chemicals and wash them thoroughly to remove all soil and insects from the underside of the leaves or roots. The leaves, which are high in calcium, potassium, and iron, are best when they are young and tender, and are most flavorful in early spring before the first flower buds appear. They can be consumed fresh or cooked in boiling water for 10 minutes to take away some of the bitterness (especially leaves from mature plants). Or dress the greens with lemon juice to reduce the bitterness. 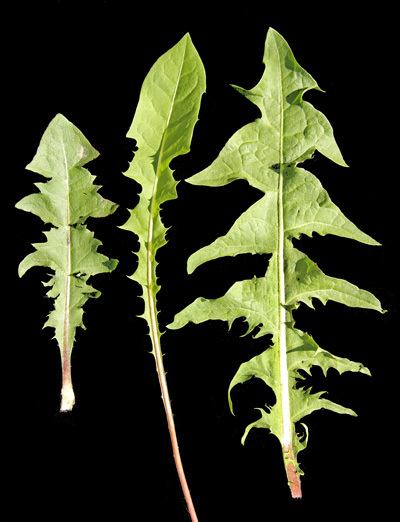 The slightly bitter young dandelion leaves make a good substitute for chicory, arugula, escarole or curly endive or for cooked spinach. The roots can be eaten as a vegetable with a turnip-like flavor if dug in early spring. The outer skin is very bitter, so they should be peeled first. Boil, then drain, then cook and season the roots as for carrots. Dried and roasted 2 year old roots can be used as a caffeine-free coffee substitute. Be cautious of ingesting too many roots as they are reported to be both a diuretic and a laxative. The leaves, flowers and roots of dandelion are edible. Blossoms, too, can be eaten fresh, and are sweetest when picked early in the season. They should be used immediately after picking because the flowers will close up quickly. The flowers can also be used to make wine, tea or jelly, or young buds can be boiled, pickled, sautéed, or cooked in fritters. If you believe herbal medicine reports, dandelion is a virtual pharamcological wonder with properties to cure everything from acne to yeast infections. The latex-containing sap is a styptic and combats acne, boils, diabetes, eczema and warts, while preparations of the leaves or roots are purported to be a non-potassium depleting diuretic (supposedly as effective as Lasix®) useful for treating fluid retention, cystitis, nephritis, and hepatitis, and obstructions of the bladder, gall bladder, kidney, pancreas and spleen obstructions, as well as for snakebites, colon cleansing, nonspecific heart distress, and cooling energy (to “cool out excess liver functions”). Plus it supposedly protects against cirrhosis of the liver and cancer! Some caution is recommended: due to high potassium content, those with diabetes mellitus, kidney problems or taking ACE inhibitors should not take this herb. Also, some people may be allergic to dandelions. 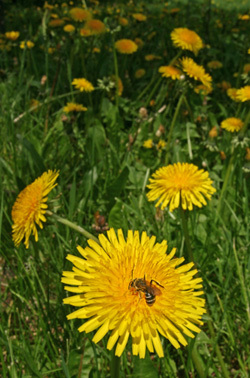 Anyone allergic to latex should also avoid handling fresh dandelions because of the latex in sap. Dandelion can be grown in a garden, or just foraged wherever found. Should you actually want to grow dandelion intentionally, sow the seeds on the soil surface or slightly covered from early spring (4-6 weeks before last frost) through late summer. They should germinate in ten days at 55 ºF. Space the plants six to nine inches apart in rows twelve inches apart. You can also get a head start by sowing in early spring in a cold frame or indoors, then transplanting the seedlings into individual pots when they are large enough to handle (but use a pot deep enough to accommodate the tap root), and then plant them out in early summer. 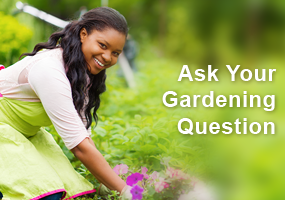 It’s essential to pick the flower heads, not only to keep the plant’s energy going to root and leaf production, but also to spare yourself future weeding. Your crop should be ready in 85 to 95 days. But check your local regulations before sowing your crop; in some places (e.g. Pueblo, Colorado) it is illegal to grow dandelions! Dandelions flowering in a lawn. 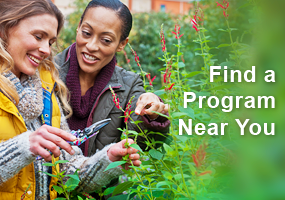 No matter how many dandelion leaves and flowers you pick to eat early in the season, this probably won’t be sufficient to control their spread in your yard. 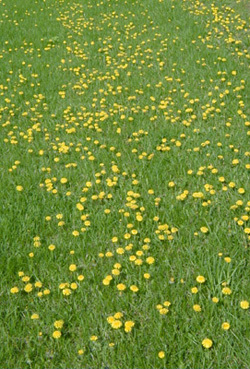 Dandelions are generally only a problem in lawns that are not growing vigorously enough to out-compete the weeds. 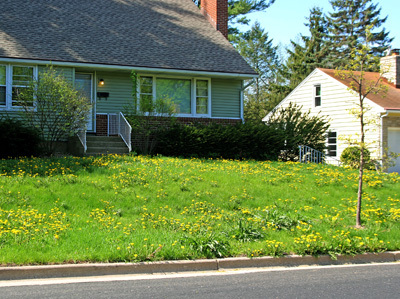 The first step in dandelion control is to create a thick, healthy lawn that will prevent dandelions (and other weeds) from getting started in the first place. Perhaps the lawn needs more fertilizer, or the soil is too compacted, or the grass has not been mown at the proper height. Dandelions are more of a problem in lawns that are not growing vigorously enough to outcompete the weeds. 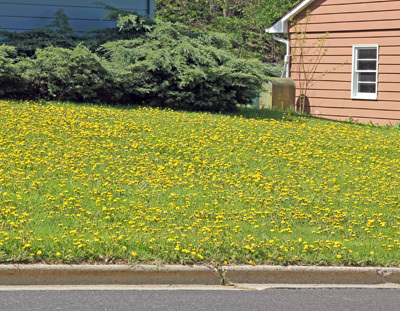 If there are only a few dandelions in an area, mechanical control may be the best option. Use a digging stick or other garden tool that can be inserted into the ground along the dandelion root to pop the dandelion and at least 2-3” of its root out of the ground. Plants will regenerate from root pieces, particularly from the top half of the root, so try to pull as much of the root out of the ground as possible. 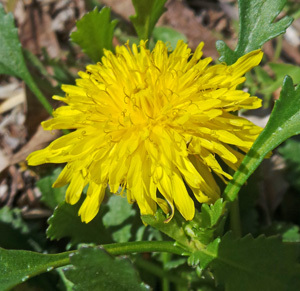 Broadleaf weed killers, such as 2,4-D, dicamba, and MCPP, in the common “weed & feed” fertilizer mixtures will kill dandelions whenever the plants are actively growing. 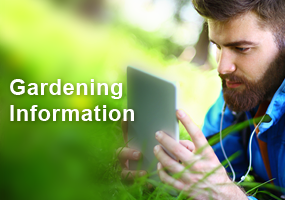 Spot treating individual plants that occur sporadically throughout the yard may be more effective than broadcast treatments in well managed lawns. Several herbicides will control dandelions. Although late summer and early fall is the best time to control dandelions, spring applications of 2,4-D will have some effect. Dry granular formulations must be applied to wet grass and weeds; the material is only effective if it sticks to the leaves. Liquid formulations can be applied anytime, but choose a calm day so the material will not blow or drift onto other plants. Remember that broadleaf weed killers will kill many plants, not just weeds. Dicamba is absorbed through the root system of plants, so keep products containing this herbicide away from shallow-rooted trees and shrubs to prevent injury. Regardless of the product, read the label and mix and apply according to the directions. Roundup® or other formulations of glyphosate are not the best choice for dandelion control. The chemical quickly knocks back the leaves, but doesn’t kill the root. The plant that regenerates often has a group of weak stems coming back from the root, that break off easily, making it even more difficult to dig out. Brand names are listed only for reference. Such references are not intended as an endorsement by the University of Wisconsin – Extension over similar brands. I was very surprised to learn of the wide variety of medicinal uses for dandelions. And also that you shouldn’t handle them if you’re allergic to latex. Each dandelion plant can produce up to 20,000 viable seeds! Now I understand the source of the problem. Depending on whether you consider it a plant or a weed, of course. Nice to know that dandelions have nutritional value and medicinal properties. As many people, I’ve enjoyed this plant/flower since childhood.